Happy Tuesday! I'm back today with another What I Ate In A Day post (you can see last week's food diary here). I'm vegan, so of course everything I'm sharing is free from any sort of animal products/by-products. Of course I drink a ton of water throughout the day - I try to get in at least 8 cups every day. Today is actually World Vegan Day, and it's also my 9 year vegetarian anniversary - I went vegan a few months after going vegetarian. To start off my day I made a Lychee Banana Raspberry Smoothie! It may be getting cold outside, but I drink smoothies year round - they're just so easy and delicious. For lunch I made Gardein's Meatless BBQ Chick'n Wings served with Daiya's Blue Cheeze Dairy-Free Dressing and fries. I love Gardein products for when I'm feeling a bit lazy or don't have the time to cook! Throughout the afternoon I snacked on kiwis and an Asian pear. I've really been enjoying both Oh She Glows' cookbooks, and for dinner I made the Oh She Glows Enlightened Miso Power Bowl, which was delicious! This meal consists of quinoa, carrots, edamame, roasted sweet potato, and an orange-maple-miso sauce. The flavours all worked really well together, and it was actually my first time cooking quinoa, if you can believe it! I found these Go BIO Vegan Gummi Bears at Rainbow Foods here in Ottawa, and I picked them up, mostly for my husband to try. 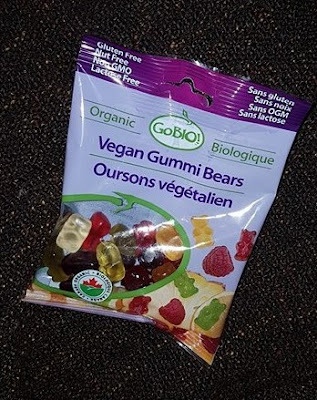 The food he misses most since going vegan is gummy worms, so he was excited to try these out. They definitely have a different texture than traditional gummies made with gelatin, but they were still really good!